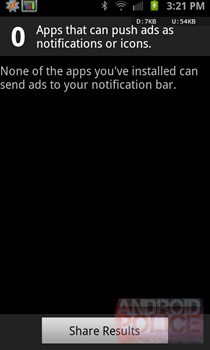 One of the most annoying features of some of the free apps available on the Market are the developer ads which keep popping up into the notification bar of your phone without requiring any action from you. In a way they are as bad as pop-ups that show up when you click a link on the web, and they are annoying because they keep popping up in your notification bar all of a sudden. 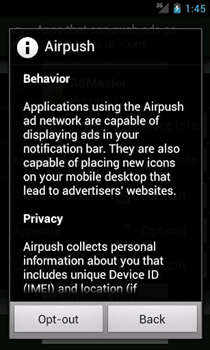 Once you scan your phone using the Push Ad Detector, it will show you a list of offending apps (if there are any), and will give you the option to opt-out of those networks, to get more information on them, or simply uninstall the applications using them. 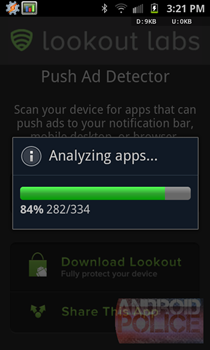 Lookout has one of the best security apps in the Market, so it’s very trust-worthy. 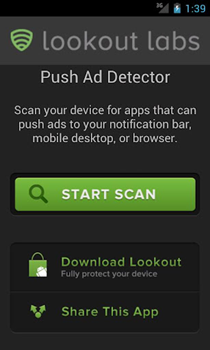 Although, I don’t usually focus too much on the “anti-virus” capabilities of such apps, the truth is Lookout has been very innovative and on their toes and this app apparently seems to always be on the “look out” for such new ways to protect your device. 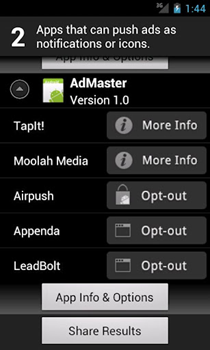 Tags	#Airpush	#Android	#Appenda	#google	#LeadBolt	#Lookout Labs	#Moolah Media	#Push Ad Detector	#Startapp	#TapIt!